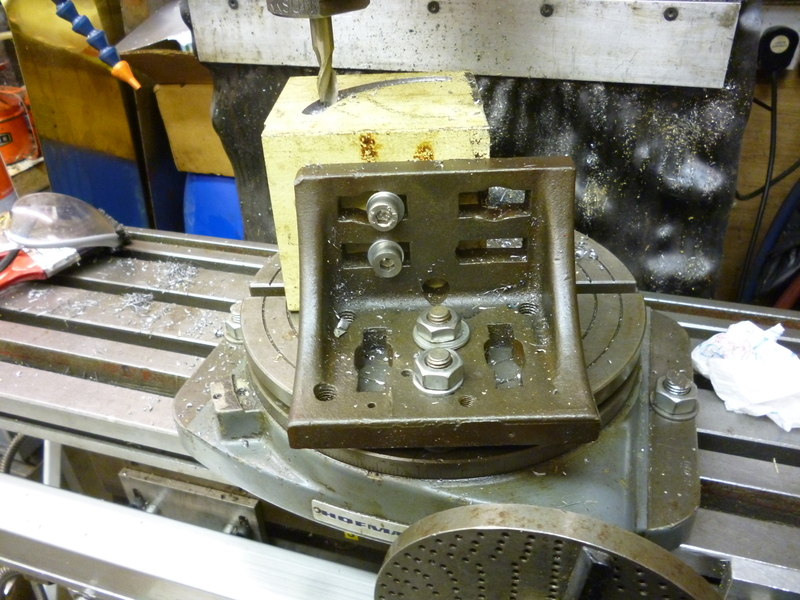 There are time when it might seem that it would be useful to mount a vice on a rotary table. But, there is a problem. When using a rotary table where the axis of rotation is relative to the workpiece is critical. The problem with a vice is that because of the position of the points with which the vice can be clamped are fixed, at the very best it might be possible to mount the vice so it can move in either the vice’s x or y direction, but not both. To move the workpiece in both the x and y directions on the rotary table can be done using an angle plate. This is because on most angle plates one side has slots in one direction and on the other side it has slots in the other direction. Of course, an angle plate does not hold a workpiece in the same way as a vice would. But if we can drill some extra holes in the workpiece then it can be held on the angle plate and the workpiece can be moved in both the x and y directions relative to the rotary table. It can be seen that movement in one direction is controlled by the bolts holding the angle plate to the rotary table. Movement at right angles to this is done by moving the workpiece left/right on the angle plate.